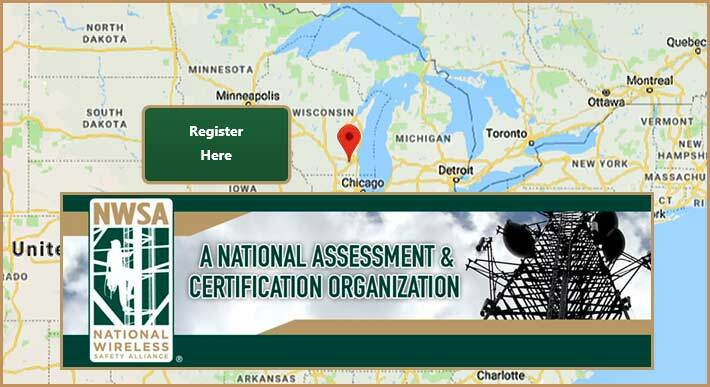 The National Wireless Safety Alliance (NWSA) is encouraging industry employers, trainers and workers to register for the upcoming Telecommunications Tower Technician Practical Examiner Accreditation Program (PEAP) Workshop scheduled for April 23-25 in Mukwonago, Wisc. The workshop, the first offered by NWSA in 2019, will be hosted by ENSA North America. Registration is available here. · Have a direct email address to receive email notifications from NWSA (this may not be a shared address). Individuals interested in participating are encouraged to complete the NWSA PEAP Workshop application and return it to NWSA via email to jeniel.shaw@nws-a.org. The deadline to register for a workshop is two weeks prior to the first day of the scheduled event. NWSA reviews all potential participants’ applications before admission to the workshop is granted. All applications must include payment and the submission of a resume or will be considered incomplete and will not be processed. Each workshop is strictly limited to eight (8) participants and will be filled on a first-come, first-serve basis. “NWSA is excited to host our first PEAP workshop of 2019 in Wisconsin,” said Executive Director Duane MacEntee. “These accreditation workshops are a vital part of our growth plan as expanding our network of accredited examiners will lead to exponential growth in the number of NWSA credentialed workers in the marketplace,” added MacEntee. Companies interested in hosting a future PEAP Workshop at their facility are encouraged to complete the host application HERE and submit the form via e-mail to jeniel.shaw@nws-a.org.